The purpose of this blog post is two-fold: First, to update the graphs that were first presented in an April 26 posting on this web site to reflect the more recent data (an additional three months) now available. And second, to discuss and present some numbers on what would be implied if government employment, which has fallen sharply under Obama, were allowed to recover to the increase seen during the George W. Bush presidency. A posting on July 6 on this site noted that this by itself would bring the unemployment rate down to 7.3% from the direct effect of employing these teachers, policemen, and other government workers who have been laid off (or new ones not hired), and an unemployment rate of 6.4% with a conservative estimate of a multiplier of two. This post will discuss this in more detail, including an estimate of what the cost would be. 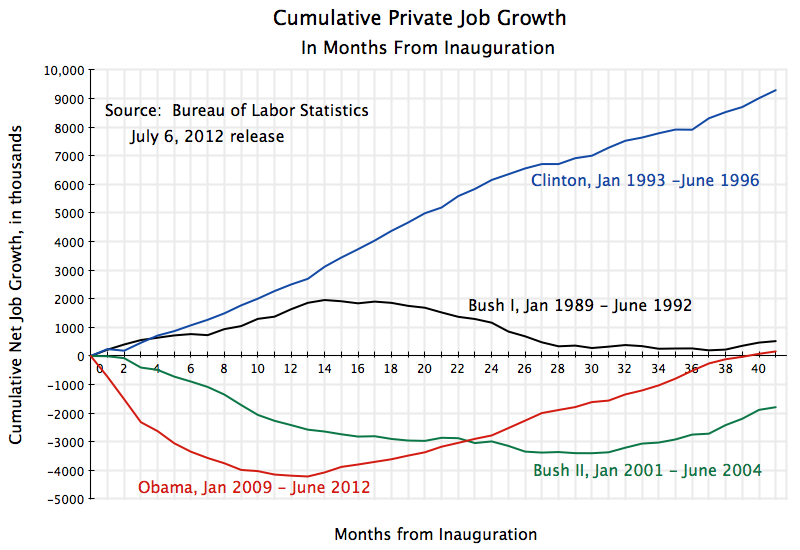 The figures above show what cumulative job growth has been, for private jobs and then for government jobs, from the month of inauguration to June 2012 for Obama (the most recent data now available), and to the equivalent points in the presidencies of the first Bush, Clinton, and the second Bush. Under Obama, private jobs are now back to where they were (and in fact slightly above) when he was inaugurated. The economy was in free fall at that inauguration, with the economy losing 800,000 private jobs per month. The stimulus package Obama was able to get passed a month after taking office, as well as aggressive actions by the Federal Reserve Board and other measures, started to bend this curve almost right away, leading to positive job growth starting a year after Obama took office. Since then, 4.4 million new private jobs have been created under Obama. In contrast, private jobs fell during the similar period under the presidency of George W. Bush. Private jobs were steady in the first few months after he took office, but then started to fall, and continued to fall for the first two and a half years of his presidency. They then started to recover, but at the similar point in his presidency (June 2004) there were still 1.8 million fewer private jobs than when he took the oath of office. Yet Romney and other Republican Party leaders are calling for a return to the tax cut and financial deregulation (or non-regulation) policies of Bush. The pace of private job growth did pick up starting in 2004 under Bush, and this continued into 2005 and 2006 as the housing bubble built up. But then this bubble burst, private employment started to fall in 2007, and private employment was crashing in 2008. The graph also shows the strong and steady private job growth during the Clinton period. And under the first Bush, private employment grew for the first year of his presidency (although at a slower pace than under Clinton), but then leveled off and began to fall. At this point in the presidency of the first Bush, private jobs were barely above where they were when he was inaugurated. 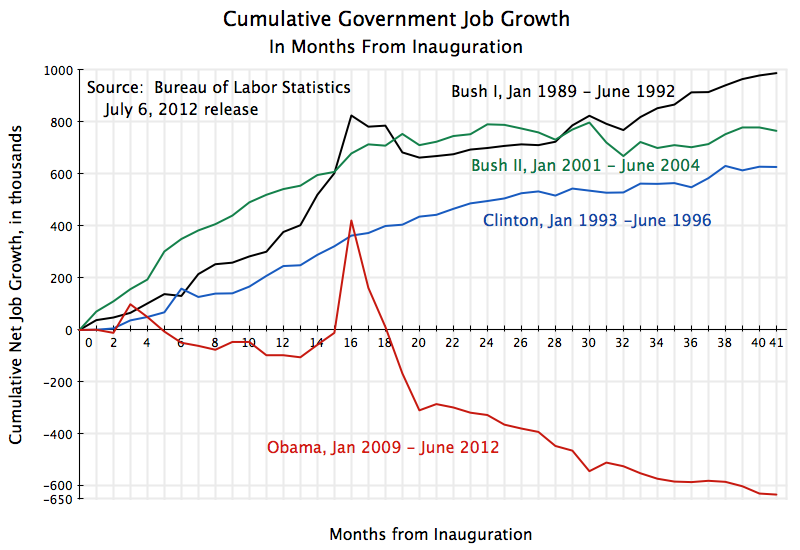 The second graph above shows what happened to growth in government jobs during these presidencies. Government job growth (primarily at the state and local level, which accounts for 87% of all government jobs) was significant during the administrations of both of the Bush presidencies. It was also significant during the Clinton period, although at a slower pace than under either Bush I or Bush II. In stark contrast, government employment has fallen sharply during the Obama term (except for the temporary spike at the time of the hiring for the decennial census, after which it returned to the previous downward trend). From Obama’s inauguration to June 2012, total government employees fell by 633,000. During the similar period under Bush II, government employment rose by 766,000. Yet Romney and other Republicans assert loudly and in the face of such evidence that the government sector has grown enormously during the Obama term, while Bush II was a small government conservative. There was a similar growth of government workers (by 776,000) during the similar period of Bush II’s second term, from his inauguration to June 2008. Had government grown during the Obama term as much as it had during the similar period in Bush II’s terms (either first or second), there would now be 1.4 million more public sector workers employed (633,000 + 766,000). This is not a small number. The implications of this loss on the labor market and on unemployment will be discussed in the next section. These cut-backs in government employment during Obama’s term as president have acted as a significant drag on the labor market and on the economy as a whole. Keep in mind that these are mostly state and local government workers, where the largest numbers of such employees are in public education (teachers) and public safety (police, firemen, and similar). State and local governments have cut back on the number of such workers either out of necessity (as their tax revenues collapsed in the downturn, and there are often tight limits on what they can borrow), or in some cases out of choice (as conservative and mostly Republican governors and other officials have used the downturn to cut back on such government employment, ofter while simultaneously cutting corporate and other taxes). But schools and other public services have suffered. The 1.4 million workers not employed in government equals 0.9% of the labor force. The direct effect of employing such teachers and others rather than leaving them unemployed would bring down the rate of unemployment from the current 8.2% to a rate of 7.3%. But there will be further employment impacts when such workers move from unemployed to employed. They will now have income to spend in their communities and in the economy, and additional workers will be employed to provide these goods and services. They will not necessarily spend all of their additional income (some will be used to pay down debt, or saved by other means), but a significant portion will be. Furthermore, the newly employed workers (newly employed to provide such goods and services to the additional teachers and other government workers) will themselves spend a high portion of their income on goods and services provided by other workers, continuing the process. This is the concept of what economists call the multiplier. Views and estimates vary on the size of the multiplier, in part as the multiplier itself varies depending on the types of workers employed (those with high incomes will likely save more and hence spend less, for example), on how close the economy is to full employment, and on other factors. But note that the multiplier for expenditures for the direct hiring of low and middle income government workers (such as teachers, policemen, health care workers, and so on), will be substantially higher than the multiplier one would expect from providing tax cuts, for example. Tax cuts primarily go to those with higher incomes (as they account for a higher share of taxes), and those with higher income will save a large share of such tax cuts. As another example, increasing government expenditures in such areas as weapons procurement will also have a lower multiplier, as the funds there will be used to hire relatively skilled and hence relatively high income aerospace and technology workers, or will accrue as profits to defense firms like Boeing or Lockheed, with a significant share saved. Similarly, the multiplier resulting from government spending for construction projects or others done via procurement from private firms, should be expected to be less than that from directly hiring teachers and similar low and middle income government workers. There is therefore no unique “multiplier” which applies in all circumstances. But for hiring low and middle income government workers such as teachers and so on, a reasonable estimate is that in current circumstances the multiplier would at least be two. Many would argue it could be three or even higher, although there are also some conservatives who would argue it is less than one or even zero. But with a multiplier of just two, hiring 1.4 million workers directly (to bring government employment back to the path it was on before) would lead to an overall increase of national employment of 2.8 million (1.4 million government workers, and 1.4 million others). This would bring unemployment down to a rate 6.4% from the current 8.2%. With a multiplier of 2 1/2, so that an additional 3.5 million Americans would be employed, the unemployment rate would fall to just below 6%. There is always some unemployment (due to labor market turnover) even when the economy is at “full employment”, with this generally taken to be unemployment somewhere in the range of 5 to 6%. Therefore, such a program of hiring 1.4 million government workers to bring government employment back to the path it was on before, would likely suffice by itself to bring the economy back to, or close to, full employment. Stated another way, the reason the job market performance has been so poor during the term of the Obama presidency, with national unemployment still exceedingly high at 8.2%, is that we allowed government (primarily at the state and local level) to lay off so many government workers in this downturn (or not hire new ones to replace those departing), rather than stay on the previous path. Note that bringing back 1.4 million government workers to return to the previous path would lead to an increase of just 6.4% in the number of government workers from where they are now (at 21.9 million workers). This is not such a huge increase, and as noted, simply brings the number back to the path it was on before. Another way to look at the number is as a share of the US population. The US population is growing, and a growing population needs more government services. If the share of government workers in the US population were the same in June 2012 as it was in January 2009, we would have 1.3 million more government workers employed now. This 1.3 million figure is close to the 1.4 million needed to return to the previous growth path. The cost of hiring 1.4 million more teachers, policemen, firemen, and other public workers is also quite manageable. The average cost of employing government workers at the state and local level is $85,612, based on data drawn from the most recent report of the Bureau of Labor Statistics on Employer Cost of Employee Compensation. Of this cost, about two-thirds is in wages paid directly to the employees, and one-third covers the cost of various benefits (primarily the costs of paid holidays and leave, health insurance, and retirement). But note that the average cost of existing government workers will be higher than the cost of new hires, as new hires will come in at lower wages and benefits to start. Hence using this figure is a conservative estimate of the cost, and in reality the cost of hiring 1.4 million new government workers will be less. But even using the $85,612 figure, hiring 1.4 million new public workers would cost $120 billion per year. This is equal to 0.8% of current GDP. And as a double check on this figure, recall that the 1.4 million new workers would be equal to 0.9% of the labor force. The figures are similar, as one would expect. A cost of $120 billion is not small, but should be put in context. Romney has proposed a tax plan which in the year 2015 alone would reduce Federal Government revenues by $900 billion relative to what they would be if current law is followed, or $480 billion less revenues if one allows the Bush tax cuts to be extended in full. If one can afford $900 billion a year in tax cuts, most of which will go to the rich, or even $480 billion, then one can easily afford $120 billion to employ the teachers, policemen, and other government workers who have been laid off or not hired. And as has been noted previously in this blog, Obama has signed into law a total of $1.5 trillion in tax cuts so far in his presidency, of which $1.4 trillion were cuts that applied Fiscal Years 2009 to 2012. That is an average of $350 billion in tax cuts per year over these four years. Spending $120 billion per year to bring the economy back to full employment is far less than this. One might immediately wonder how this could be, but it is important to keep two points in mind. First, tax cuts do act to stimulate the economy, but as discussed above, are not terribly efficient as a form of stimulus as the bulk of tax cuts go to the relatively well off, who will simply save a high share of what they receive in tax cuts. Second, the tax cuts, while inefficient (and taken in combination with other measures, such as some stimulus spending and aggressive actions by the US Federal Reserve) have brought the economy to where it is now. The economy was in free fall when Obama took the oath of office, and these measures reversed the collapse and have brought the rate of unemployment down from a peak of 10% to the current 8.2%. But the recovery has not gone farther because, in sharp contrast to the path taken in other US recoveries (see the blog posting here), government has been laying off rather than hiring workers. Government employment has been cut back sharply during this downturn, in sharp contrast to the paths followed by other recent Presidents (see the graph above) or in contrast to the paths followed in any other downturn in the US of the last four decades (see the blog post cited above or here). As a result, there are now 1.4 million fewer government workers than there would have been, had government employment been allowed to grow as it had under Bush. This has added significantly to unemployment. Had such teachers, policemen, and others been kept employed, the economy would likely now be at, or close to, full employment. By itself, the cuts can account for the weak recovery that Obama is now being blamed for. This entry was posted in Labor, The Economic Crisis and tagged employment growth, government employment, job creation, jobs, private employment, unemployment by aneconomicsense. Bookmark the permalink.